The Sundowner is always on the move, never finding his home. 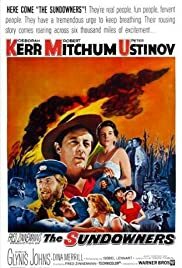 Set in Australia in the 1920s,this wonderful movie tells the story of sheepdrover Mitchum, wife Kerr and son Anderson, drifting through the Australian wilderness,never settling down.Tired of constantly being on the move Kerr wants a home for her family,but Mitchum is insensitive to his family's wishes. Deborah Kerr gives a fantastic performance that brings to life even the inner emotions of her character.She's never been better.Robert Mitchum is very believable in his assignment.It's perhaps one of his most complex roles.Also Peter Ustinov scores a triumph:A man too irresponsible to have a family of his own,and therefore clings to Mitchum and Kerr's family. The story isn't much on paper,but Fred Zinnemann's imaginative direction gives the incidents the needed emotions. Beautiful cinematography and sock performances from the rest of the cast makes this a movie you shouldn't miss.